Bucky: You weren’t trying too hard to help, I notice. Natasha: Hey, this was meant to be your show… not mine. From Captain America #34, by Ed Brubaker and Steve Epting. 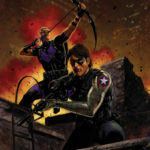 Issue #10 – • Her mind cracked and warped, can Bucky save the Black Widow…from herself? 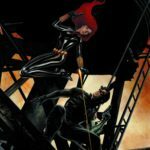 Issue #11 – • The hunt for the Black Widow is on! And Hawkeye is in the trail! You know, I was kind of enjoying that Natasha was one of the few characters in Brubaker’s run to not get terribly brainwashed. These sorts of stories are tricky to pull off when the whole brainwash thing is presented as something for other characters to react to rather than something for the victim to overcome. But we’ll see. Bucky: Damn it… we’re two steps behind when we should be tracking him down. This is what he wants us to be doing. Natasha: No, the Red Skull wanted another wave of economic fear to rip through the country… we just stopped that. And we’ll keep at it. That’s what Captain America does, remember? Bucky: Yeah, I guess it is. I think there’s a temptation to describe this pairing as two broken people finding ways to become whole together, two living weapons learning to live, and I see how that’s attractive but I don’t think it actually describes their dynamic. Bucky’s story is a redemption narrative, and more particularly a struggle to see himself redeemed. But that’s not Natasha’s fight— for better or worse, she doesn’t feel the need to apologize. The past in her stories is something to be escaped, not something to be reckoned with. More than that, though, she had her redemption arc in 1969 and has struggled on since. She carved out her own life, her own redemption, and ultimately she did it herself because there was no way she could have done it otherwise. And that strength, that specific strength of having been there, and done that, is what she offers him. You can see it here. 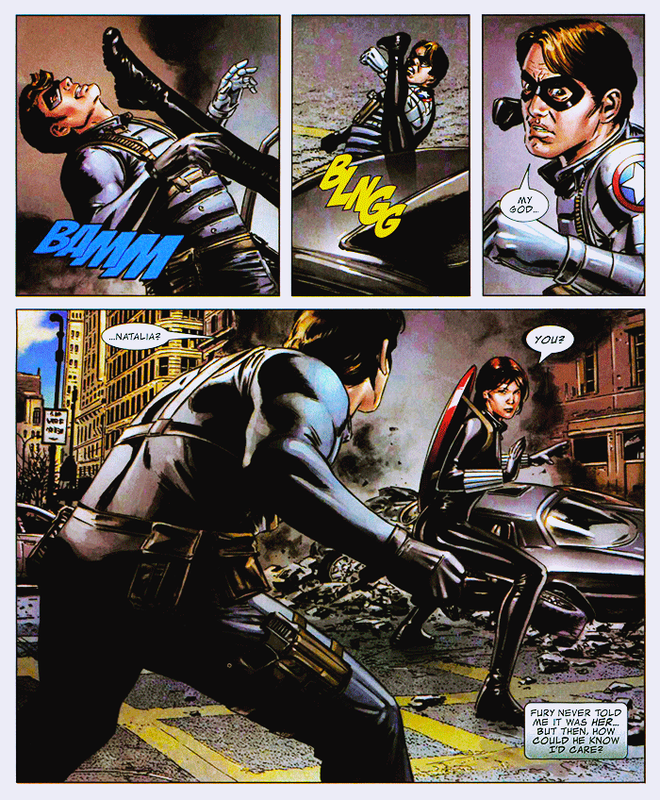 She reminds him how to be Captain America, because parts of him might have forgotten. But she hasn’t. 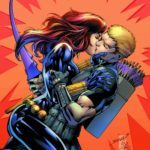 · The secret behind Avengers Assemble is revealed but what does it mean for the future of the Marvel Universe? · PLUS: The return of the characters you demanded! · Old enemies resurfacing with new codenames. · And nothing will ever be the same. Some July solicits, to get you speculating. Natasha: Sims comes through with more than a location on our target He also gets me a copy of MI6’s file on Professor Chin. And two pages into it, I completely understand why James is in such a hurry to find this animal. And then five pages into it, I find out James has been keeping something from me. In 1968, Chin’s bride was killed during an attempted assassination on Chin. The prime suspect in that assassination was the Winter Soldier… who is wanted for crimes against the state in China. Damn it, James… you stubborn fool. So one issue later and Natasha’s figured out the Mystery Thing Bucky was trying to keep from her— there’s a dual narrative of Natasha discovering this stuff along with the reader, and then Bucky taking over in the next few pages and narrating it for himself. I think her obvious frustration with him is pretty cute. Mostly because Natasha would probably do the exact same thing. She is highly secretive herself, and also has a definite tendency to run off into dangerous situations alone on big dumb hero missions. But that’s not going to stop her from being annoyed when other people do it. Meanwhile, in plainclothes fashion blogging: I like that Epting doesn’t dress Natasha in, well, a salmon flower tank top or something that’s aggressively reminiscent of a black catsuit with a dangle belt, but I thik this outfit leans a bit too drab. From Captain America #46, by Ed Brubaker and Steve Epting. Natasha: So, you going to tell me where to find him, or do we put your MI6 training to the test? Sims: Oh, I’ll tell you, Natasha… for a small price. Natasha: Easy, soldier… I’m involved. Off the market, as they say in the civilized world. Natasha: Deadly. So why don’t we make your price the antidote to the poison I put into your first drink? Then we can catch up on all times. I’ve written about this scene before, I think, and what I like about it isn’t that it really establishes her commitment to Bucky Barnes, though obviously that’s one thing it does. It’s incidental, I don’t really think she’d have slept with this guy if she didn’t already have a boyfriend. And Natasha has always been a person of deep, if idiosyncratic, personal loyalties— not cheating on her boyfriend is not blazing new territory. But I do really like this scene, and not just because it shows a ladytype one-upping a sexist cad, and here’s why. There’s this spy trope about the beautiful women you might meet in darkened rooms, who find plain looking guys and use their lovely bodies to deceive them. This is a deconstruction of that trope, a plain looking guy meeting a beautiful spy and assuming her lovely body is his to use. Like I said before, this is an arc about the past, about old grudges and old allies and old wounds that still need healing. But this encounter Natasha has with a washed-up agent in a world that’s left him behind is a reminder that she has a past too, and obstacles that Bucky and Namor never had to overcome, wars they never needed to fight. And her casual triumph here, in a book where the measure of a person is the amount of crap that they’ve lived through, is just another reminder: she is the best there is at what she does. Sims: Rumor is your Professor Chin is the guy who accidentally invented bird flu. Only perhaps it wasn’t an accident, after all. Natasha: I thought you just said he retired ten years ago, Sims? Sims: I know… the work ethic of these people. Brubaker’s Captain America is full of beige-colored bars, usually seedy dives where lost men go to mope. This place is more expensive, and Natasha didn’t go here to be alone, but it still represents a fringe space in the Marvel Universe. This sequence runs parallel to one of Bucky and Namor chatting up old days gone by, and similarly these panels run headfirst into yesterday. Sims is an MI-6 agent abandoned in post-British Hong Kong, casually racist (“the work ethic of these people”) even as he orders a drink from a Chinese-presenting bartender. These are the spaces Natasha has to inhabit, the sort of cloying ghosts of a Cold War past, dressed up in drinks at the bar. But Sims here is a pretty hopeless deadbeat, a reminder, in an issue obsessed with flashback, of what can happen if you don’t let yourself move on. Natasha: Yes. She’s taken some punishment… but she’s still with us. Sam: Look at this…Arnim Zola and the Red Skull? Sharon did all this? Natasha: I wouldn’t put it past her. She’s always impressed me. Here’s some more insight into Natasha’s relationship with SHIELD— she’s apparently noticed and been impressed by Agent 13 before. When Sharon is fully conscious they seem to bicker more than shower each other in mutual respect, but I think her ability to do her job is what Sharon would most like to be complimented on. It’s a nice reminder that even though in a superhero context Sharon is almost always outmatched, she is an exceptional SHIELD agent. I do have my issues with how some of Sharon’s plotline was executed, but I think it did show an extraordinary strength of character. She was better than Bucky at fighting off brainwashing. Anyway, I like Sharon Carter, and it’s nice that Natasha does, too. From Captain America #42, by Ed Brubaker and Steve Epting. Natasha: All right, people… let’s find our agent! Because I forgot to post it last time, here’s Natasha leading her troops into battle. There’s a hint at the kind of esprit de corps that must exist within SHIELD, that we never get to see much of because for the most part they are comprised of nameless goons and sometimes LMDs. 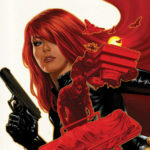 It’s never been shown or explored— how does Natasha relate to the SHIELD rank-and-file? Is she an outsider because of her Avengers/superhero status? Or do they see her as one of their own? From Captain America #41, by Ed Brubaker and Steve Epting.